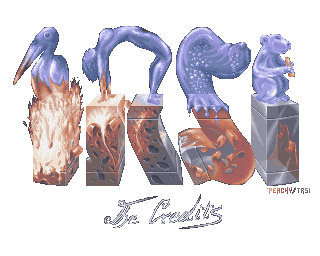 I collected over the years pixel art of all kinds, especially from the Commodore AMIGA, the Commodore 64 and the PC (when people still “pixeled” there instead of “photoshop” everything). If you do not know what I mean, have a look at this post of mine about Perspective Projection on the Computer. It touches the subject of hand-made pixel art on the side, but uses some nice examples and illustrations. I was particular a fan of logo art work, because that was something I did myself. I was never good at drawing or painting objects, people or animals. You only have to look at my ANSI/ASCII art galleries and will see that most of the stuff are logos only and if I did anything else, then the results were way below average in quality. Any of my attempts to draw people and faces resulted in something that looked rather funny, although this was rarely my original intention. So I eventually accepted the truth and stuck to what I did best, logos … styling text/words, so to speak, just as clarification for the “normal” folks out there. I got around to take my logo collection and do as much de-duping as I could, spending several hours on just that and upload my collection to Flickr.com, for everybody to access freely. I did not include my Commodore 64 collection, which is still a mess, but a bunch of C64 pixel art logos sneaked into the Flickr.com sets anyway. I grouped the logos by title and not artist, creating a set for each letter of the alphabet and grouping all the set within one big collection, which you can access via this link. There are over 2,000 logos my friends, in case you asked yourself how I can spend “hours” on de-duping stuff. Okay… here are some of the most famous logos of all time… the cream de la cream… the top of the top of the pixel art logos so to speak. Okay, I think you got it, so lets start with the show hehe. 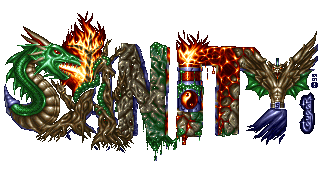 Ultra famous logo, used over and over again, also on the PC later on, where almost nobody ever did a new one for them, because everybody was convinced that you couldn’t come up with a better one. 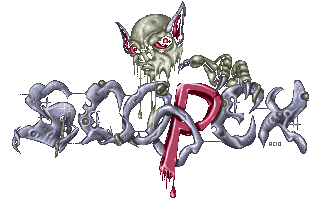 If you have never seen this logo before in your life then I am asking myself, how you ended up at this blog reading this post? Seriously! TRSI – Tristar and Red Sector Incorporated logo by J.O.E. Together with the previous logo for Fairlight, probably the most recognized scene logos of all time. Same as for the Fairlight logo… it was used over and over again, also on the PC, but in contradiction to the Fairlight case were some folks confident enough to draw new logos to compete with this one by J.O.E. and I have to admit, some did a damn good job at it. See for example the other TRSI logo by Peachy further down below. but is probably as equally famous as this one. The “zoomed” or “ASCII style” like Melon logo text became somewhat of a trademark for Melon Dezign. They use the same motive over and over again throughout various Melon demo and intro/cracktro projects. most famous of the logos of the cracking group Shining 8. Are there any other logos? I am not sure, no joke! Razor 1911 logo (I believe by Sector 9)?????? okay, this logos is maybe not so famous, but I had to add a Razor 1911 logo to avoid trouble, so I picked a very old logo and not any of the new PC ones by Zebig, Facet or Kenet etc. That is enough for now! 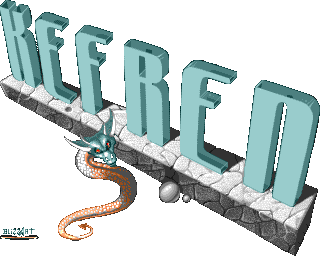 Again, you can find these logos and over 2,000 other and less famous pixel art logos at this Flickr.com collection of mine. Check it out, it’s definitely worthwhile to spend some time there. Uh… what happened to the fancy background? Mhhh … I suppose that this was a queue for me to signal that this is the end of this blog post. Okay, so be it!